This rating scale was designed to provide participants with some idea of the difficulty and level of paddling skills required for each club trip. Most of our club trips are rated between Level 1 and Level 4. The level for each trip can be found in the trip's event description on the events calendar. Members should sign up for trips with levels that match their skills. The club provides multiple training opportunities each year for members who wish to improve their skills. Visitors who wish to try a test paddle before joining the club may sign up for Level 1 and 2 trips, dependent upon their skill levels. Note that trip levels may change unexpectedly depending upon weather conditions, so members should always check with the trip leader if questions arise. Paddling on very sheltered water with access to the shore. No previous experience is necessary. Distances are typically 0.5 to 6 miles. 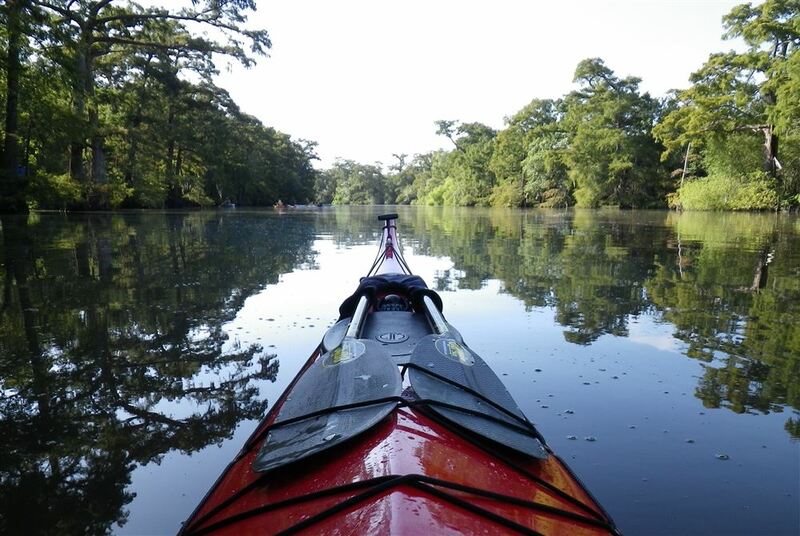 Paddling on sheltered water, rivers, bayous, and lakes within 1/2 mile of shore. Paddlers may encounter waves 1 foot or less and current up to 1 knot. To participate you should be able to paddle in 12 knot winds, and should be familiar with at least one partner rescue. You must be able to perform a wet exit. Paddling is in bays or lakes with slightly choppy to choppy conditions with waves up to 2 feet and currents up to 2 knots. There will likely be boat traffic. During such trips you may be up to 1 mile from shore. Launch and landings will be sheltered not requiring surf skills. You should be able to paddle in up to 2 foot chop in 15 knot winds. You must be able to perform a wet exit, and you should be able to perform both a self-rescue and partner rescue in level 3 conditions. You should have good basic strokes especially good bracing skills. Ocean and bay paddling near shore but may include crossing of up to 10 miles in bays or 2 miles in ocean. Must be able to paddle in 2-4 foot seas in up to 15 knot winds and be able to launch and land in surf up to 3 feet for ocean trips. There may be currents of up to 2 knots. You must be able to perform a wet exit, be proficient in self and partner rescues. You must also be proficient in paddling in Level 3 conditions. Having an Eskimo roll is highly recommended. Level 5 Ocean paddling. You must be able to paddle in 4-6 foot seas in up to 20 knot winds and be able to launch and land in surf up to 4 feet. There may be currents of up to 4 knots. You must be proficient in paddling in level 4 conditions and have a reliable Eskimo roll.